Grab your motorcycle, put your knees in the breeze and enjoy the beautiful scenery of eastern Oklahoma. Ride the hills, switchbacks, tight curves and straights of our asphalt roller coasters. South takes you to the Ouachita Mountains and Talimena Drive, a National Scenic Byway that is breathtaking in every season. In the fall, the colors of Oklahoma are glorious with sweeping vistas of rolling hilltops and mountainsides. Don’t miss Robbers Cave, a favorite hideout of Jesse James and other famous outlaws. Remember… The reward is in the journey. Whether you’re into green meadows or white knuckles, the perfect journey begins and ends in Muskogee. Plan your adventure today by clicking the link below to download your free copy of our REAL OKIE RIDE GUIDE today! 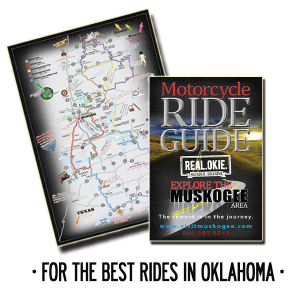 For more details on trip itineraries or motorcycle friendly road information, contact RIDE MUSKOGEE via Facebook by clicking below!